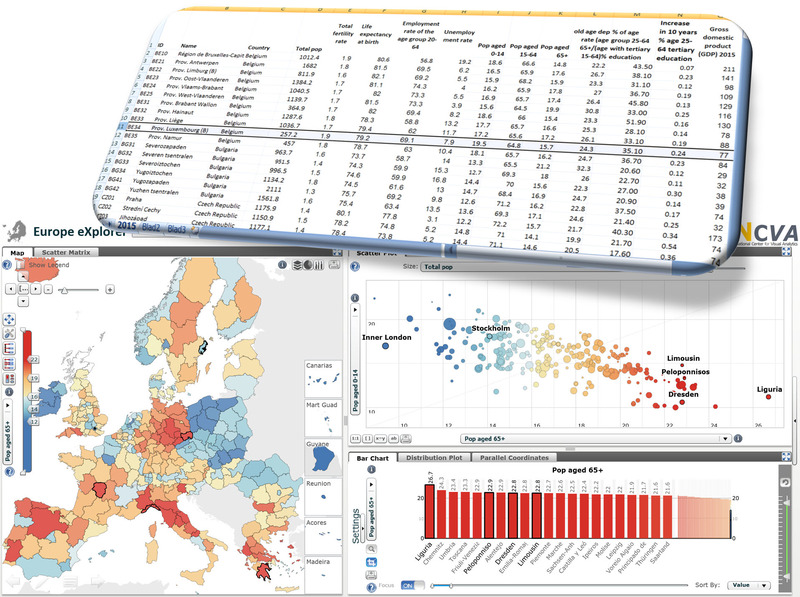 europe eXplorer will open with regional NUTS2 data for 2015 (se Excel sheet). Abstract sound information at sub-national level and benchmarking of regions across national borders has increased in importance in the policy agenda of many European countries due to higher integration driven by institutional processes and economic globalisation. 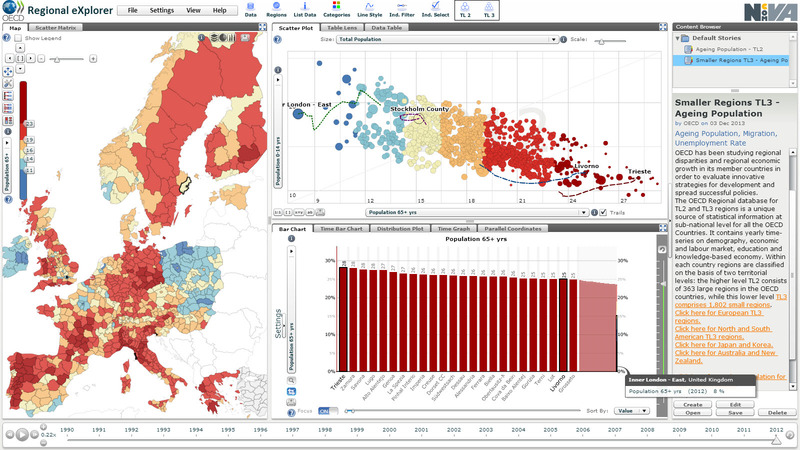 Geovisual analytics techniques help illustrating complex regional, spatio-temporal and multidimensional statistics. “Europe eXplorer”, was developed by NCVA in collaboration with OECD and Eurostat for visualizing and better understanding the socio-economic structure of European NUTS2 or NUTS3 regions.The EU Member States are often compared with each other, but in reality it is very difficult to compare a small Member State like Malta, which has around 420 000 inhabitants, or Luxembourg, which has around 540 000 inhabitants, with Germany, the most populous EU Member State at close to 81 million inhabitants. Comparing regional data that are as detailed as possible is often more meaningful and this also highlights the disparities — or similarities — within EU Member States themselves. The European Union places considerable emphasis on cohesion policy, with the objective of bringing Europe's regions and cities closer together in economic, social and environmental spheres. EC countries experience a growing interest in regional development. The performance of regional economies and the effectiveness of regional policy help determine a nation’s growth and shape the measure of well-being across countries. For the past years Eurostat has been studying regional disparities and regional economic growth in its member countries in order to evaluate innovative strategies for development and spread successful policies. This interest has generated new demand for sound statistical information at the sub-national level on factors that are important to enhance economic growth and living conditions. and can be loaded with othar indicators from the Eurostat database based on NUTS2 or NUTS3 using Excel. Figure: Europe eXplorer with NUTS2 regions showing age group 25-64 with tertiary education 2014-2015. 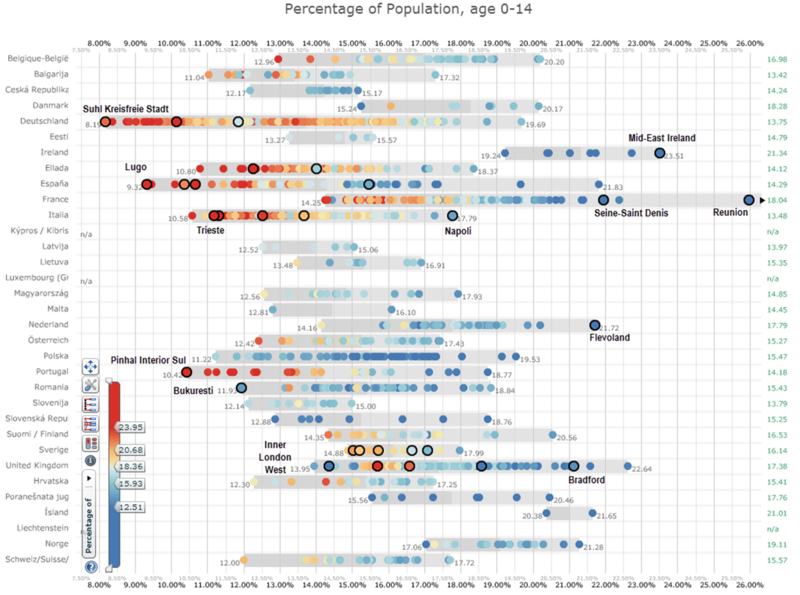 Three coordinated and linked views (Choropleth map, scatter plot, and bar chart). The map, bar chart and scatter plot (horisontal axis) show age group 25-64 with tertiary education while the scatter (Bubble) plot also shows correlation with GDP/BNP (vertical axis). Figure: List of European NUTS2 regions with highest level of education (See "Column M" in EXCEL below). Compare also with the map above, where red regions correspond to those regions witg highest level of education. Figure: Europe eXplorer is here applied to NUTS3 regions showing ageing population in Europe. A small region in Portugal is highlighted having the highest population ageing people. To access Europe eXplorer with NUTS3 regions - click on the "NUTS3 Icon" or select a NUTS3 story in the story panel. Figure: This Distribution Plot in Europe eXplorer, shows each NUTS3 region along a horisontal axis "age group 0-14" for each country. The region "Reunion" in France has the youngest "0-14" population. Red bubbles represents NUTS3 regions with an eldery population 65+. We see that Germany, Portugal, Greece, Italy and Spain are among the European countries with regions having a large percentage of elderly population. But they also have regions with a much younger population. Data provider: Import data from SDMX, PC-Axis, Excel or txt files. Authoring: Explore and gain insight, motion visual representations in a creative discovery process. Tell-a-story: Storytelling tools are integrated into the geovisual analytics process transforming statistical data into knowledge. The snapshot mechanism helps the author to highlight data views of particular interest, and guide others to important visual discoveries. Collaborative stories support a shared understanding with other statisticians and, after consensus has been reached placed in the public domain. When you are satisfied with the Story, i.e. visualizations, data, chapters, storytext, snapshots and metadata you must save your Story file as an XML file on your computer. Publisher: Import Story, select layout and visual representations, and create the HTML5 code for embeddable interactive motion visualization and finally publish on a web site or blog "Vislet". A Story with snapshots and metadata is created in the eXplorer Story Editor (see figure below) – A story is saved and can be shared with colleagues to reach consensus. "Storytelling" is achieved through a mechanism in eXplorer that supports the storage of interactive events through “memorized interactive visualization views” or “snapshots” that can be captured at any time during an explorative analytics process and becomes an important task of a web-based storytelling authoring analytical reasoning process. In the figure below we see a "snapshot" Chemnitz - coordinated and linked between the Map, Snapshot list and integrated into the Storytext. The interactive Vislet below embedded into this web site was produced from a Europe eXplorer Story, saved on a local, imported into our Publisher (views are setup), HTML5 code is created and embedded into your own web site. Zoom in on the map with (-) or (+) or use scroll with mouse - click on your region and see the coordination with the two other views. 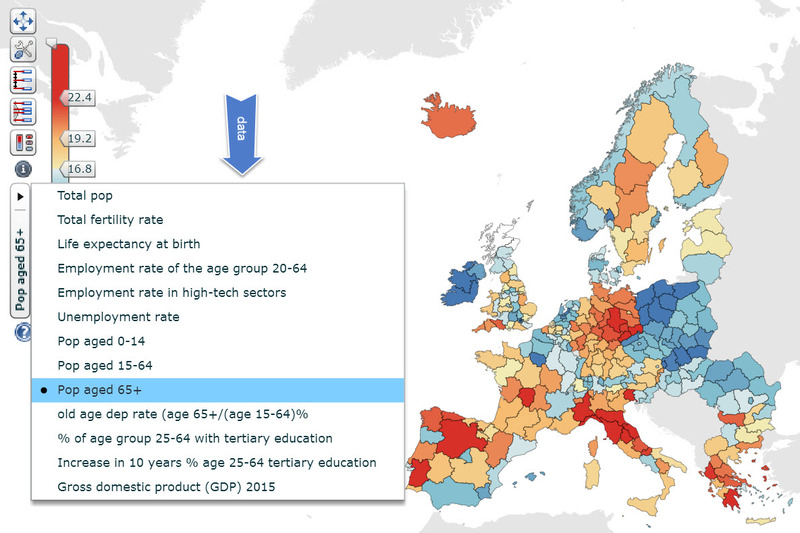 Figure: Eurostat Regional NUTS2 Statistics Regional Visualization using our HTML5 tools. Total Fertility rate 2013. These tools HTML5 are explained at: http://ncva.itn.liu.se/education-geovisual-analytics. Figure: Eurostat Regional NUTS3 Statistics Visualization. Time linked choropleth map and distribution plot showing unemployment rate 2011. A time slider shows data 2003-2011. The OECD Regional Database provides a unique set of comparable statistics and indicators on about 2 000 regions in 34 countries. It currently encompasses yearly time series for around 40 indicators of demography, economic accounts, labour market, social and innovation themes in the OECD member countries and other economies. The OECD Metropolitan Database provides a set of economic, environmental, social and demographic estimated indicators on the 275 OECD metropolitan areas (functional urban areas with 500 000 or more inhabitants).